The GluNEO® Lite test meter is used with GluNEO® Lite test strip for the measurement of glucose in fresh whole blood samples(Capillary and/or venous). It should not be used for the diagnosis or screening of diabetes or for the testing of new born babies. 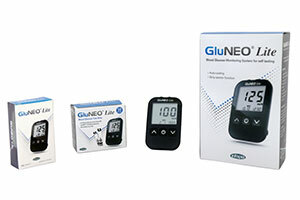 GluNEO® Lite Blood Glucose Monitoring System is for self-testing by people with diabetes and by healthcare professionals.